I'm a day behind on this update, but here it is. Work progressed more on the set; I was able to reach the goal I set last week where I was to get the set painted and pretty close to finished and then start on the organ. When the main bulk of the set was done, I primered and then painted the entire set a dark grey. Then I gave it all a dark wash for weathering. The entire floor was painted dark brown, but as with the Dinner scene, the floor will be mainly covered with carpets. Then I worked on the two aquariums on both sides of the set. I framed them with a half inch recession and then covered them with a piece of plexiglas sprayed with Testor's Dulcote so you couldn't see all the way through them. I painted "portholes" gold and added some clipping from the backyard for the seaweed in the aquariums. I started on the most detailed and most important piece of the entire set--Nemo's pipe organ. For starters, I sized and printed a photo to get an idea of the right scale. Using this, I printed up drawing from the Disneyland Paris attraction that features the organ in it (though that has differences that will be corrected). 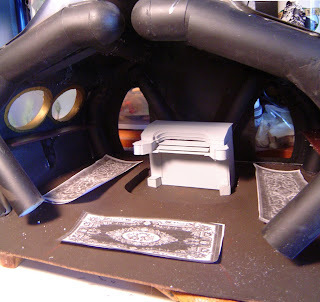 From the drawings, I cut, sanded, layered, and glued several pieces of styrene together. This will be a very accurate pipe organ, so this will take some time; I'm really fussy with the details on it. At this point, the main body of the organ is done and given a coat of primer. The next step will to add the intricate woodwork and sculptural aspects of it. Hopefully I'll have the organ done completely done by the next update and the rest of the set complete (except for the number jars on the shelves). I may not get to doing the Nemo figure just yet this week, but I hope I do.